© Australian Association for the Teaching of English Inc, 2007. This article has come about due to a synthesis of my experience and research into English teaching pedagogy. Whenever I taught a text, I found that the best methodology to use was one that analysed the piece for the most affective elements that were present and constructed lessons around these elements. This conscious search for emotional content also leads to improved engagement with the language, characters and the plot of the story by the students. However, the articulation of these processes is not so straightforward. I have found elements of what happens when a teacher looks for emotional content and uses it to construct their classes in reader response theory (Holland 1968), in that great English classes narrow in on the affects that are present in texts, and they make them live through the work that the teachers and students share.On the other hand, it is important to note that the affects that motivate and excite the class into increased levels of sustained reading and analysis with respect to texts were also connected to the social and cultural aspects that were under scrutiny through study. This resonates with much of the recent discussion about English teaching in Australia and critical literacy (Luke 2000). The study of literature should be relevant to students’ lives, in that it concerns social and cultural issues in contemporary society. 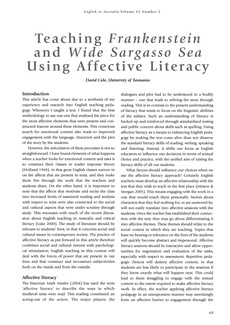 The practice of affective literacy as put forward in this article therefore combines social and cultural interest with psychological stimulation; English teaching in this context will deal with the forces of power that are present in our lives and that construct and reconstruct subjectivities both on the inside and from the outside.